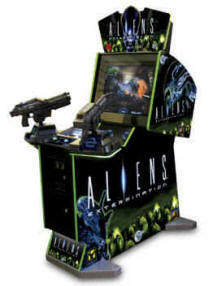 Global VR has just released a new and very innovative video arcade game based upon the movie series "Aliens"! The newest incarnation of Aliens takes place after Ripley and the surviving Colonial Marines leave planet LV-426. A mop-up operation headed by the colonial marines returns to the planet to finish off the Alien population that ravaged their troops years before. In the game the players take control of one of the best weapons in the Colonial Marine arsenal - the M41A 10mm Pulse Rifle, plus a Missile Launcher, Flame Thrower and 30mm grenade launcher! Working hand-in-hand with U.S. Army Subject Matter Experts and with the full cooperation of units of the U.S. Army, the coin-operated AMERICA'S ARMY is a realistic and engaging game centered on exciting training exercises, and includes a significant amount of authentic Army videos and other information designed to immerse the player in the Army culture. 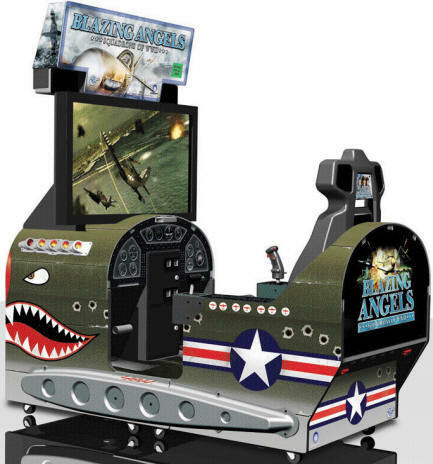 BLAZING ANGELS, a 360 degree flying game is designed for both novice and seasoned players. As the game begins, players are given clearly defined mission objects and fly realistic WWII aircraft. The excitement is non-stop as players engage in well know air-battles such as Pearl Harbor, Midway as well as fly the skies over Europe and Africa. Take to the skies and test your combat skills fighting in true World War II battles. Test your mettle as a fighter pilot in 6 WWII Campaigns (easy, medium or hard difficulty) that include London, Africa, Pearl Harbor, Midway, Rabaul and Ardennes. Beat a medium or hard scenario and fly an amazing bonus level… Berlin. From the dogfights to clearly defined mission and objectives, players will engage in combat action that will keep them coming back again and again. The story begins at the gate of a dilapidated amusement park where 2 detectives are on the hunt for a group of missing people. It is their mission to find and free all 100 hostages. Players will be entertained on all of the 15 selectable levels (and one bonus level) and enjoy the competition found in the 12 mini-game missions. This 2 player shooter is refreshing and different and will be enjoyed by players of all ages and skill. Frightmareland will be available in both 42” Standard and 50” Deluxe models. Global Arcade Classics is the end all for all your Arcade Classics needs. With over 83 games loaded into one system, you'll never be at a loss for any classic game you can remember. Global Arcade Classics has enough control options including a trackball, 6 Buttons per player for the advanced fighters, and state-of-art joysticks for complete control of every character or vehicle. 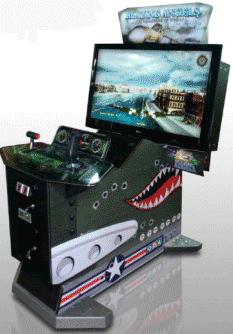 26" Standard or 42" Deluxe with Flat LCD Screens brings all action & characters to life. KABOOM lets your customers load and detonate TNT to blow up vacant buildings making room for new real estate projects. Players load the maximum amount of TNT in order to win maximum tickets. ...Then KABOOM! Push the plunger and feel the blast. Available 1st week of November. King of the Big Wheel is a proven winner! An eye-catching, colorful redemption game, King of the Big Wheel is a walk-up and play sensation. Easy for everyone to play and a snap for owners to operate....this game delivers on all promises! The latest and most affordable Prize Redemption Merchandiser has just landed in the U.S. and is available now. Having made its debut in the United States at the IAAPA trade expo, Marksman has been tried and tested and has proven itself to be one of the top earning prize merchandisers currently available. Experience the Thrill of NASCAR® Racing! EA SPORTS™ NASCAR® Racing gives players the thrill of the NASCAR racing experience equaled only by the real thing. From the cars, to the drivers, to the NASCAR-Sanctioned Tracks, this racing masterpiece will be seen in locations for years to come. It's the only game with 6 licensed tracks, including Daytona™, Bristol™ and Talladega™. Selectable drivers include Dale Earnhardt Jr. (#8), Jeff Gordon (#24) plus many more. All tracks, drivers and drivers' cars are accurate in every detail. Link up to 10 cabinets to get the complete NASCAR experience. Easy to play and exciting to drive, the latest installment in this blockbuster franchise delivers many new and updated features. Players will enjoy "a full Nascar experience" when they select from one of the many licensed and fantasy tracks and slip behind the wheel of this extraordinary game. Need for Speed Carbon is GLOBAL VR’s newest installment in the Need for Speed series of arcade games. It features Tuners, Exotics, and American Muscle cars competing on urban street and drift tracks. Players will drive for their reputation on some of the most exciting tracks ever! Grab your bathing suit and your Uzi - 'cause you've never had a vacation like this! GLOBAL VR® does it again! 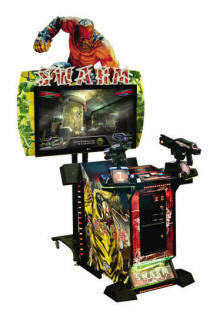 Paradise Lost brings a new level of enjoyment and a brand new user experience to this tropical gaming extravaganza. Over 50 missions in the game. with each getting progressively more difficult. The Deluxe upright cabinet features a 42” LCD display. Grab your bathing suit and your Uzi -'cause you've never had a vacation like this! READY TO TEE UP WITH THE PROS? The year's biggest event in video golf is here with EA SPORTS™ PGA TOUR® GOLF Championship Edition. This highly anticipated annual update delivers 24 challenging PGA TOUR® and Fantasy courses, all rendered in breathtaking detail. And the best game in video golf gets better with improved gameplay - every club and shot type has been fine tuned to meticulous detail. All the Fun...Without the Shuffleboard Table! It's Everything an Arcade Game Should Be! 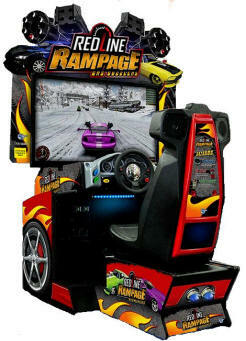 It's the best of both worlds ... Redline Rampage combines the thrill of racing with the excitement of a shooter. Select from a range of cars including muscle, exotics, or imports; 6 unique and beautifully rendered tracks make each game an adventure. Moscow is in shambles! Our hero must ward off an alien onslaught to save himself and the human race. In Red Square, at the doors of the Kremlin, and through underground Moscow, he faces aliens of unparalleled size and strength. With each challenge he finds himself becoming more like those he fights against and is able to use their powers against them. The decisions he makes will determine the fate of us all. Loops and Leaps are front and center in this high-flying racing game. High powered F-Jet racers provide a totally realistic racing experience with fine-tuned handling, air controls and over boosted engines. 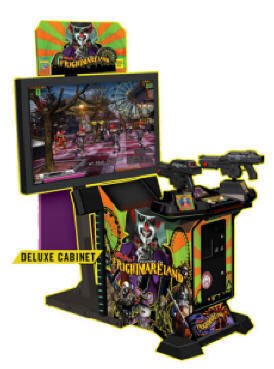 Single players can enjoy the heart-pounding action or heighten the competition by linking up to 4 game cabinets. 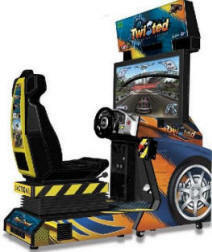 Standard racing rules apply...but that is the only thing standard in this Twisted game! Now comes with 12 titles! Only have space for one pinball game in your location? Tired of replacing parts and maintaining the same pinball game over and over? Ultrapin is the answer. Ultrapin allows you to have many different Pinball tables on one cabinet. Choose from proven favorites such as Pinbot, Firepower, Xenon, just to name a few. The Best of Pinball with None of the Hassle! Lightning-fast gaming with simple controls, Player selectable - Multiple titles keep the coin box full, Upgradeable - Software kits keep the gaming fresh, Attractive new price, Ships with Beach Head 2003: Desert War, Battle through new desert combat environments, An exciting new take on this player favorite, A GLOBAL VR Exclusive!